The LA Summer Home Staging Certification Program gives students, the education and tools needed to launch their careers in Home Staging. Our course is fast, affordable, hands-on and includes 2 months of coaching. The Academy of Home Staging's hands-on approach, equips students with the tools and training needed to launch their own businesses. Included with this program, and not with other programs, is two months of coaching. 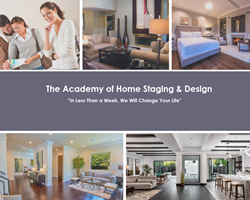 The Academy of Home Staging's hands-on approach to learning and application equips students with the tools and training needed to leave the program and launch their own businesses. Over the course of five, fun, information-rich days, our instructors and guest speakers help students master critical design principles, employ a systematic process to simplify each home staging project, and integrate sound business fundamentals into their new staging practices. The Instructors take the time to personally coach and mentor the students every step of the way, through design, business applications and hands-on classroom and field exercises. Included with this program, and not with other programs, is two months of coaching.